To Frill Or Not to Frill? Frills and ruffles this season have certainly been having their extended moment. Starting with flounce sleeve sweaters last winter to frilled hem trousers and full on multi-tiered ruffle dresses this Spring. Are you looking for an ensemble you can work into your everyday wardrobe without it being overly feminine? If so, we styled this look especially for you. I’m a huge fan of Self Portrait its an amazing label with creative and unique pieces and this top did not fall short. I love how Han played with the femininity of ruffles and the structure of a starchy men’s cuffed shirt. The idea is brilliant though in keeping it real on this blog I have to admit that I didn’t really enjoy the lack of movement with this garment. I would advise going a size up if you would like some arm movement, simply because the fabric used to keep the structure of the ruffles is rather stiff and is used for the entire garment. I went with a UK 8 here rather than a 6. Personally, I love to play up the femininity of ruffles especially on vacation and on occasion in a work to dinner ensemble, like this one! I know some of you may have a flashback to when your mother dressed you in a hideous puffy sleeved frilly dress that made you the talk of the toddler party for the wrong reasons. I must add, however, a strategically placed ruffle can do the job of a piece of statement jewellery, hide a muffin top, distract from broad shoulders or add the illusion of a fuller bust. I’m no stranger to body image issues and certainly have moments of weakness where I’m wishing I could wave that wand and transform into a better version of me. Fortunately, with a bit of clever styling we can give ourselves that little boost of confidence. If you have a bit of that bulge which I certainly have after the birth of my baby, ruffles are a great way to hide that muffin top and potentially delay the guilt of not hitting the gym as much as you’d like. Try a loose flowy delicately multi-tiered ruffle dress. We love all the options below catering to every budget. Go bold if you have a small bust, try off-shoulder large frilled tops with denim shorts for the day and transition to night with just a pair of heels and some tailored trousers. The fuller top will in-turn make your waist look smaller, Win! This hardly seems like an issue to most but sometimes top-heavy girls have told me it’s a bonus if they can find items that elongate and slim. 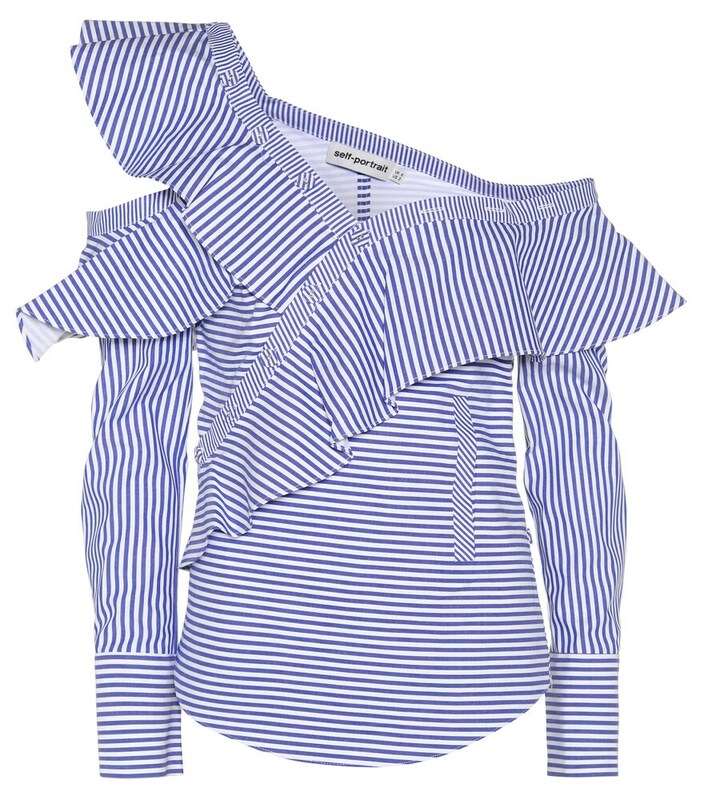 Try perhaps smaller ruffles that are vertically placed. Peplum styles instantly add hips and work best for tall and lean frames. Frills add a softness to your frame, making you go from boyish to VA-Voom Jessica Rabbit curvy. Also, try ruffle skirts which instantly add volume to your bottom half. A pear shaped body would do best with balancing out your bottom half with a bit more volume up top and accentuating your waist while sticking to A-line skirt cuts with no frills (pun intended). These White Sling Backs I found in the L.K.Bennett Summer Sale at 40% off! An amazing steal and I must say comfortable for a high street pair which was pleasantly surprising. Thanks for stopping by! Go Get Your Frill On Girl!